Before the season, I stated that Josh Beckett was the biggest key to this team reaching the promised land. I assumed top notch performances from Jon Lester and Clay Buchholz, as well as from their offense. I said that if Josh Beckett could come in and produce like a good number three pitcher, the team would be in the running for the World Series. I also predicted that he would fall a little short, but still pitch respectably. In the end, I was wrong. 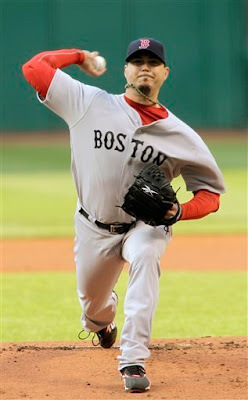 Josh Beckett was this team's best pitcher for the majority of the season. After an incredibly unremarkable season in 2010, Beckett appeared in 30 games for the Sox this year, and dropped his BB/9 from 3.17 to 2.42, as well as his HR/9 from 1.41 to 0.98. Partly because of the drop in walk totals, Josh Beckett posted a career-low WHIP of 1.03, good enough for fourth in the American League. Looking back at his numbers, however, it seems that there was at least some luck involved with his success. This can be seen by his .245 opponents BABIP (down from a career mark of .290) as well as his FIP and xFIP being 3.57 and 3.58, respectively, both higher than his ERA. He also saw a rise in his FB%, but a significant drop in his HR/FB (14.2% to 9.6%). However, this is in no way to take away from his season. Beckett carried this staff for much of the year, posting an ERA under four in every month except for September, which was horrible for everyone. This season saw Beckett throwing less fastballs and curveballs, and more cutters and changeups, which led to more variety and more off-balanced hitting. His unpredictability was a contributing factor to his success. While Josh Beckett's expectations grew as the season wore on, and a big performance or two would have been huge out of him in the final month, I base these grades on my expectations before the season. Looking back at his final stats and how he performed for the majority of the season, I am inclined to give Beckett an A-.